After its Tablet Keyboard series for the iPad and Android tablets now Logitech is coming up with something quite slick to adorn the new iPad first. 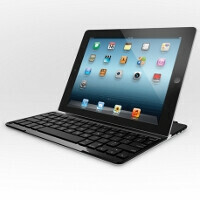 The Logitech Ultrathin Keyboard Cover for new iPad is a mouthful of a name, but focus on the word "ultrathin". This thing might have finally cracked the code of tablet Bluetooth accessories, since it doesn't add so much bulk to your slate+keyboard+stand setup that you wish you just bought a small notebook. The keyboard part snaps magnetically to your new iPad just like Apple's Smart Covers, but don't worry about scratching the screen as there is a rim around preventing direct contact of the keys with the "resolutionary" display. There is also a grove above the keyboard part, where you can slide the iPad in, and use the Ultrathin Keyboard Cover as a stand, making an improvised notebook out of both. This time Logitech provides a rechargeable juicer inside, with a microUSB port on the side for charging. It estimates you'll be able to get quite the mileage out of a full charge - about six months - provided that your average usage is roughly 2 hours of typing a day. As an added bonus the Ultrathin Keyboard Cover has all the features of a Smart Cover, as it wakes the iPad up when opened, and locks it when closed. The accessory will be available some time by the end of this month for $99.99. How long before Asus is in court being sued for ripping off Apple 'innovations'? Didn't I chase you off in shame? I understand that companies work together to form new products, however, Apple did not technially innovate this Logitech did.